(this page is a collection of articles / links / projects submitted by students regarding this topic. 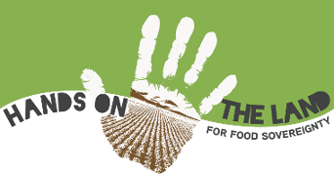 Boerengroep intends to collect different sources and view points around a certain topic in order to stimulate a critical view on the food production chain). 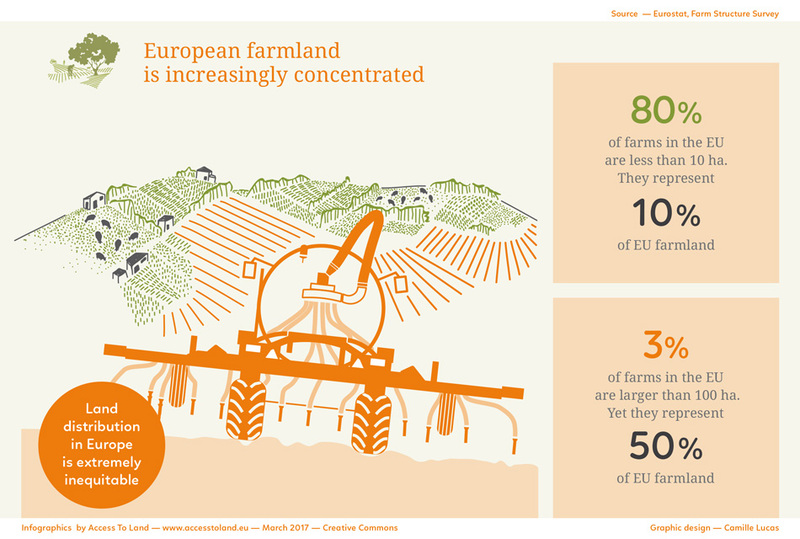 In Europe, land speculation and land concentration are an increasing threat to small and medium sized family farms and new entrants (e.g. Toekomstboeren). Soaring land prices make it increasingly difficult for farmers to have access to land. In the meantime, investors are buying up enormous pieces of land, sometimes using legal loopholes. Land is increasingly becoming a globally tradable commodity and an object of financial speculation (meaning a ‘good’ commodity to invest in, since it will increase in price more and more). The price for one hectare of agricultural land in the Netherlands ranges between 40.000 and 120.000 euros – while farmers often earn a salary below the minimum wage..
–> 56 million – total hectares of land acquired in the developing world by international governments and investors since 2008. –> 70% of the population – in sub-Saharan Africa lives on their traditional lands that, because of colonial heritage, are classified as state lands in independent Africa. This is why governments believe that they can give away their land without consultation or legal redress. ❢ Concentration of land and wealth: Small family farms are disappearing rapidly in Europe. The EU has approximately 12 million farms. –> 3% are large farms (more than 100 Hectares). 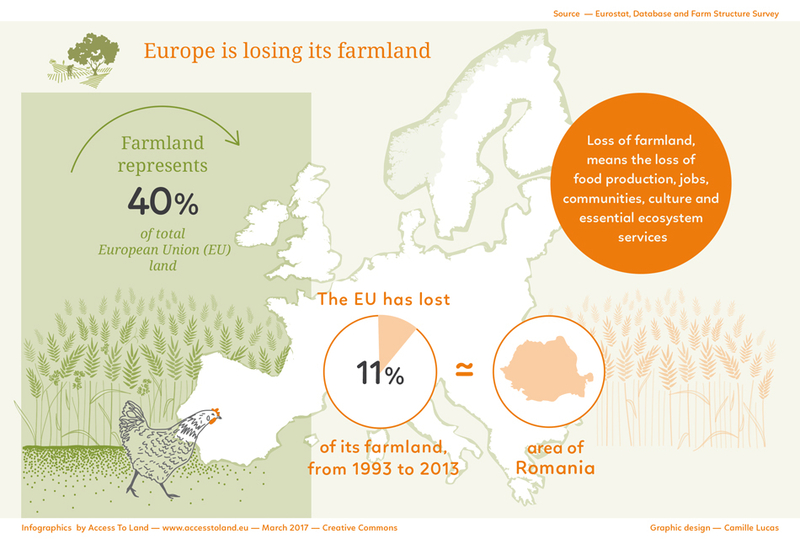 –> this 3% controls 50% of all farmed land in Europe. ❢ E.g. Germany: 1,246,000 farms in 1966/67 to only 299,100 farms in 2010 (only 24% of farms left). Of these holdings, the land area covered by small farms (less than 2 ha) shrunk from 123,670 ha in 1990 –> 20,110 hectares in 2007. While the land area covered by big farms (more than 50 ha) expanded from 9,200,000 ha in 1990 to 12,600,000 ha in 2007 (see map). Same holds true for the Netherlands: between 1950 and 2016 six out of seven farms have been lost. In 1950, the average farm had 5,7 hectares of land. In 2016, this is 32,4 hectares. Farmers can’t make a living anymore due to low income and increasing costs. Their house is often sold as holiday house to people from the city, and the land is sold to the industrializing neighbors. The amount of animals is rapidly growing: In 1950, a pig farmer had 7 pigs – currently that is on average 1600 pigs per farm. Meanwhile, the price of agricultural land has skyrocketed. In the Netherlands, the price of one hectare of agricultural land ranges between 40.000 and 120.000 euro. (See more about land prices in Netherlands here and here). This is a reflection of the new ‘interest in land’ by those with large amount of capital. ❢ This concentration of land and wealth is supported with public money, through subsidies paid under the Common Agricultural Policy (CAP). The winners of the growing land concentration and land grab are large Industrial farm-holdings, strengthening the agribusiness. 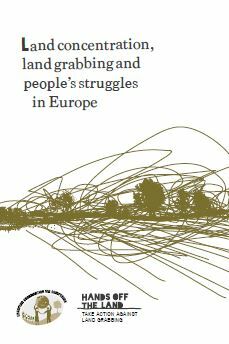 Land Concentration, land grabbing an people’s struggle in Europe. La Via Campesina. 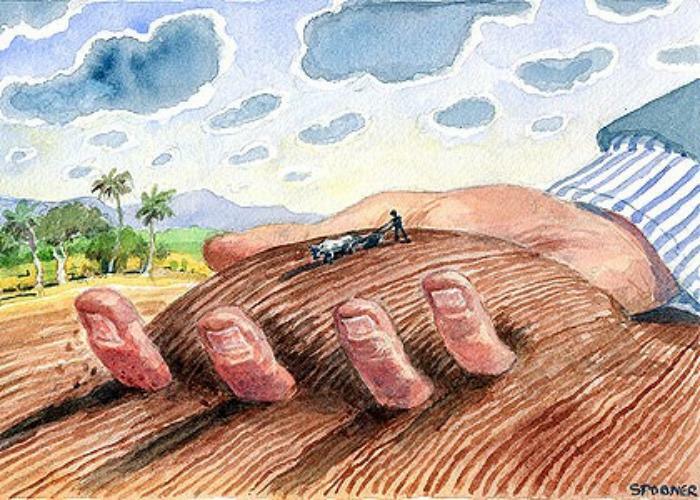 Read here..
Land Grabbing and human rights: The role of EU actors abroad. FIAN 2017. 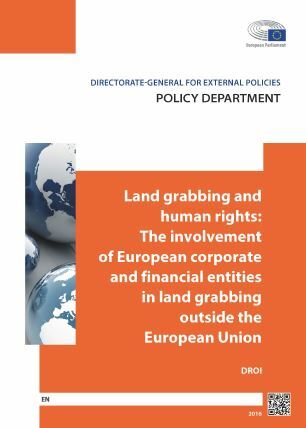 Read here..
Land Grabbing and human rights: The involvement of European corporate and financial entities in land grabbing outside the European Union. EU, 2016. Read here.. Securing the Right to Land. ILEIA, 2016. Download here..
Terre de Liens: Experiencing and Managing Farmland as Commons. Read here. Cooling the Planet: Voices from the Gobal Convergence of Land and Water Struggles. HandsOnTheLand, 2016. Read here..
Nicaragua – struggling for land and autonomy. Download here..
Land Rights issue by Oakland Institute (many reports!) here.. Caught in the Net: How “net-zero emissions” will delay real climate action and drive land grabs. Read here…“Net-zero emissions” in order to combat climate change? Instead of requiring real emissions cuts, “net” counting could allow forbusiness-as-usual greenhouse gas emissions, offset by massive-scale mitigation through the land sector. The Intergovernmental Panel on Climate Change (IPCC), outlines scenarios requiring between 500 million and 6 billion hectares of land in order to implement this dangerous offsetting approach. Developing countries are likely to be the target of this new focus on land use for mitigation. Dakar to Tunis: Declaration of the Global Convergence of Land and Water struggles, 2015. 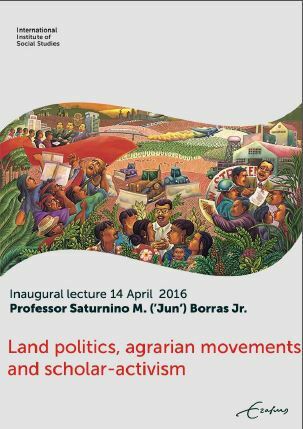 Read here..
Land Politics, Agrarian Movements and Scholar-activism. Borras, 2016. Read here.. In 2008, the world’s food system began to fall apart. However, threatened with hunger, rich countries have started buying up and leasing fertile tracts of the developing world. With 60% of all arable land in the world in Africa, this is where investors have firmly set their sights.